My kind of traffic jam …. Imagine : Barreling down a dirt road in the middle of nowhere (actually true) and beginning to believe that you really are in the middle of nowhere (it’s been nearly 100 miles on deserted dirt roads) when suddenly, you have to slam on the brakes and wait for the traffic to clear. First it’s the barking of dogs. Then it’s the lyrical giggle of a small child. Then it’s the lead goat with the tinkling bell. 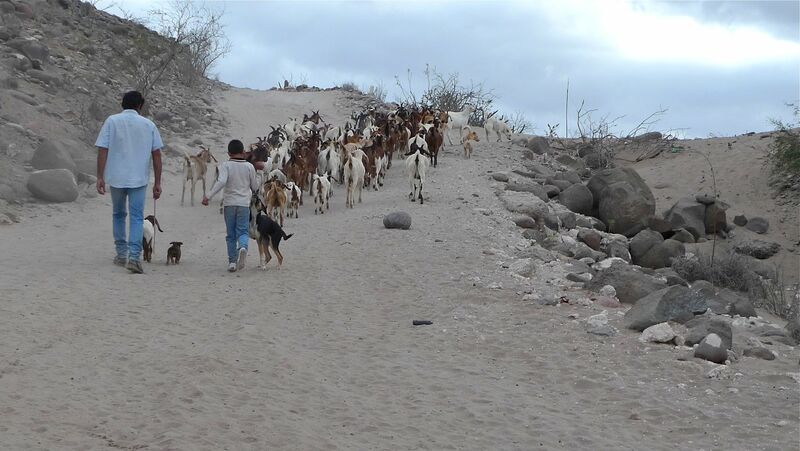 Then it’s the dad : aka goat herder : walking with the dog and the child and the goats home to the safety of their pen for the evening. Their home? A small house with goat pen and garden ‘off the road’ (at least 20′) in the middle of that same nowhere. Water? From a well. Shopping? What does one need? Serenity : Sorry mastercard, but this one really is priceless. The traffic jam? Pure joy. About 10 minutes of listening to goat/child/herder/dog chatter, and then passing through. My kind of Mexico. Simple and without pretense. Excellent…I could almost hear the barking of the dog, the children giggling, the tinkling of the lead goats bell…very nice.